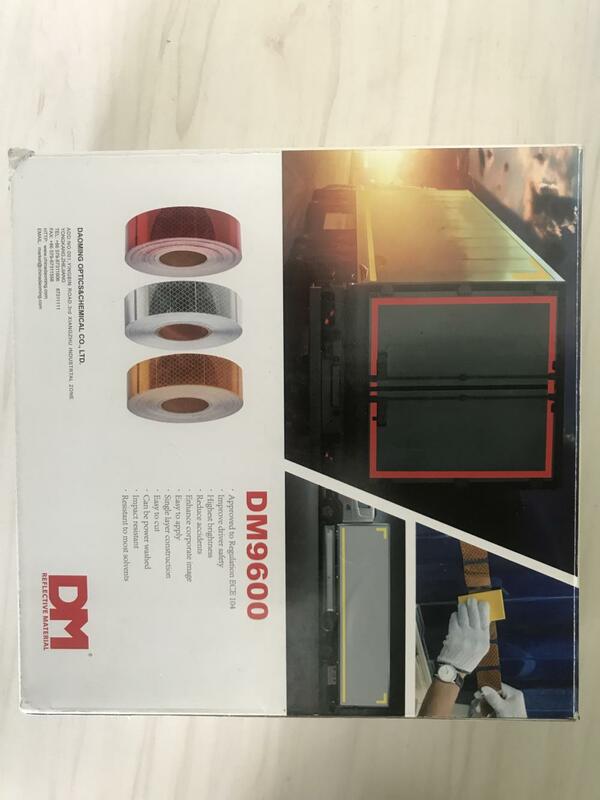 DM9600 Conspicuity Marking tape is composed of cube corner (microprism) retroreflective elements integrally bonded to a flexible, smooth-surfaced tough and weather resistant UV stabilized polymeric film. The prism surfaces are coated with a vacuum deposition of aluminium to provide a mirror surface to the prism facets.The resulting material is not more than 0,20 mm thick, and comes with an aggressive high-tack pressure sensitive adhesive.The product is single layer, with no need for edge sealing. 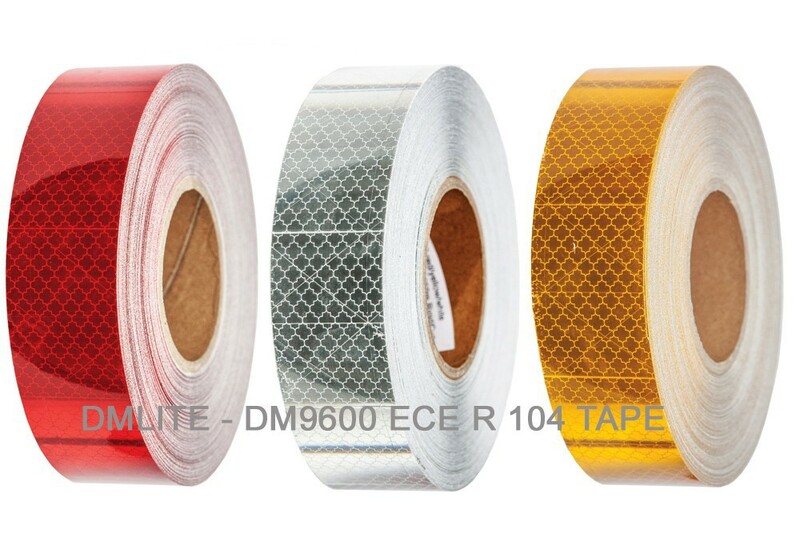 DM9600 conspicuity marking tape is available in yellow, white and red. The colours conform to the requirements of Regulation ECE 104. The adhesive is protected by a release liner, which shall be removed by peeling, without soaking in water or other solvents. A 25 mm strip shall provide a bond such that it shall support a 800 g weight for 5 minutes without the strip peeling for a distance of more than 50 mm when applied to a smooth aluminium surface as specified in the standard adhesion test. Material must be applied when the air and surface temperature is between 15° C and 38° C to assure proper adhesive bonding. Surfaces must be cleaned for all grease, oil and dirt. Use a clean towel and Isopropyl alcohol or similar to wipe the surface before application. If any air bubbles are trapped, use a pin to puncture the bubble and squeegee to push the air towards the pin hole. Please contact DM sales team for complete application instructions. Hand wash with sponge, cloth, or soft brush using warm water and detergent. The cleaner must be wet, non-abrasive, without strong solvents and have a pH value between 3 and 11 (neither strongly acidic nor strongly alkaline). Rinse thoroughly. To remove grease, oil. or tar, use cloth moistened with heptane, VM&P naptha or mineral spirits. Wash with detergent and water then rinse thoroughly. • The combined shelf life as processed and unprocessed marking tapes cannot exceed 2 years from the date of receipt from DM.However, the tapes must be used within 1 year of processing even if the combined shelf life is less than 2 years. • Store the tape in a clean, dry area and away from direct sunlight. Looking for ideal Conspicuity Marking Tape Manufacturer & supplier ? We have a wide selection at great prices to help you get creative. All the Prismatic are quality guaranteed. We are China Origin Factory of China Reflective Sheeting. If you have any question, please feel free to contact us.